This year the Canadian Opera Company Ensemble Studio presented the company’s first fully staged productions of Henry Purcell’s Dido and Aeneas and J.S. Bach’s The Coffee Cantata (seen December 1). This marked the first return to the COC of Russian director Dmitri Bertman since his controversial Traviata of 1999. Bertman, who had staged the same double bill in 1997 for his own Helikon Opera in Moscow, clearly has a plethora of ideas but doesn’t always know when enough is enough. He overburdened Dido with concepts till it broke under them, whereas in the Bach they amusingly reinforced the theme. One difficulty in Dido is maintaining an overall nobility of tone associated with the title couple despite comically grotesque words and music given the chorus of witches. Bertman decided not to bother and deliberately shifted the focus away from the title couple, costumed as a pre-Raphaelite hero and heroine, to the chorus of male and female witches dressed in modern grey business suits who without change also played the roles of the court and the sailors. Dido and Aeneas seek shelter not from a storm but from the torrent of the witches’ camera flashes. Only later, when as manic autograph seekers the witches sing “Destruction’s our delight,” was it clear that Bertman had recast the opera as a parable about stardom and the public who lives vicariously through heroes it raises up and destroys. Achieving this intriguing interpretation by skewing the work and constantly attracting attention away from the singing came at too great a cost. As Dido, Colleen Skull sang with a full, rich soprano and great emotion, but Bertman had her noisily fold a paper boat during “Ah, Belinda!” and sing “When I am laid in earth” while walking up stairs and away from the audience. 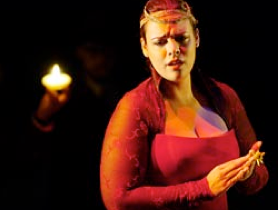 Belinda, here viewed as Dido’s main groupie, was well sung by Frédérique Vézina, in her creamier, brighter, and more agile soprano. Baritone Peter Barrett proved a most sympathetic Aeneas through the warmth of his voice and subtlety of phrasing. Despite their antics, the chorus sang like a seasoned madrigal choir. Bertman’s concept for The Coffee Cantata was much simpler. Schlendrian’s dispute with his daughter Liesgen about her coffee-habit became a miniature history of coffee drinking from the 18th century to the present. Liesgen’s ultimate triumph coincided with the current ubiquity of coffee house chains including a pause in the music for Starbuck’s (a sponsor) to serve coffee to the audience. The chance to see Liesgen’s ongoing covert romance with the Narrator alone justified staging this secular cantata as opera. Andrea Ludwig with her bright, lithe soprano made a genial Liesgen. Peter McGillivray sufficiently colored his deep baritone to be taken for an old man. Luc Robert light tenor well suited the role of Narrator. For Dido the COC Orchestra under Richard Bradshaw reduced to only nine gave a good impression of an authentic instruments band but never achieved the same lightness of texture that the group did under concertmaster Marie Bérard in the Bach. Note: A version of this review appeared in Opera News 2003-. Photo: Colleen Skull as Dido. ©2003 Michael Cooper.